Want amazing baked potatoes, straight from the microwave? Made in the USA from US materials since 2006. The results of years of testing and refinement: the layers have been tuned to precisely control the heat and moisture. The reviews on the latest version have been great! The best you’ll find — and less expensive the Chinese competitor’s potato sleeves! BE SURE TO WATCH OUR VIDEO, BELOW. NOTE: Our Logo is on the outer package to keep the cooking bag free of all inks and chemicals. When you bake your potatoes in the microwave, do they come out disappointing? That’s because you need to retain just the right amount of moisture in the potato. Too much, and you have a soggy spud. Too little, and you have a rock. 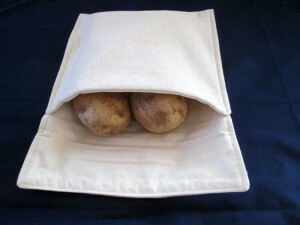 Much more than a simple potato sack, it’s a three layer structure pouch that retains just the right amount of moisture. Made from 100% cotton fabric and batting to ensure both the healthiest cooking as well as the safest. All sewn construction — no nasty glues that could taint your food as found in a cheaper potato pouch. Machine washable — easy to keep your bag fresh and clean. All you have to do is wash the potatoes, slide them into the bag, set the timer, and in just a few minutes the perfect baked potato awaits you! Want to bake a bunch of potatoes? Just one or two? 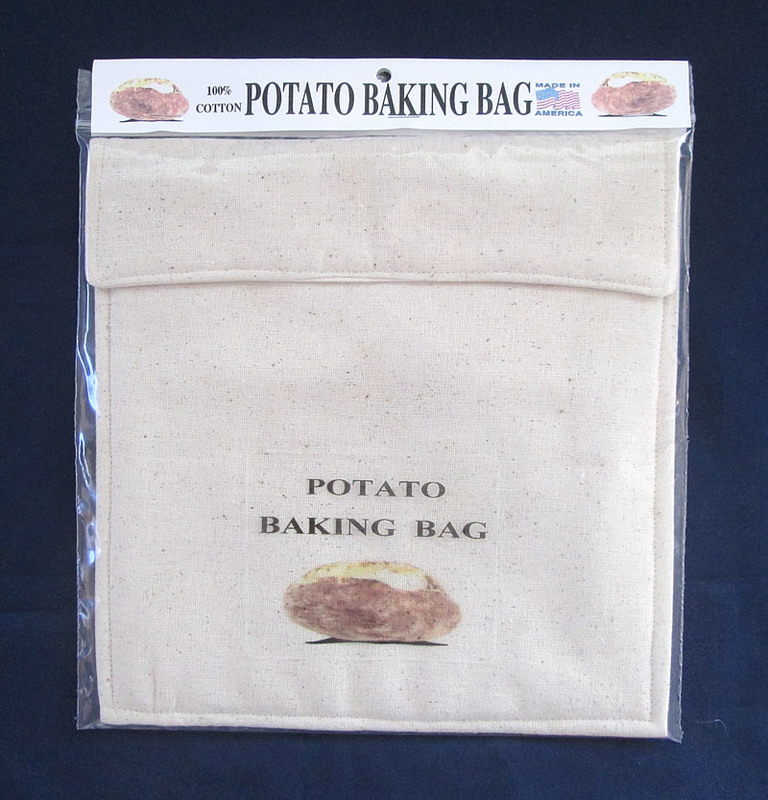 Our Potato Baking Bags are available in two sizes: The Original and The New Mini! Each Bag comes with complete instructions in the package. Our original size measures approximately 10 x 10 inches. The Mini Bag measures approximately 7 x 9 inches. You can choose which is best for you. If there are two or more people in your household and you use a larger size microwave, then the original size would be best for you. If you are a single person household, then the Mini Bag will probably be best for you. PLEASE NOTE: COOKING ONLY ONE POTATO IN THE ORIGINAL SIZE BAG MAY CAUSE IT TO OVERHEAT. AT LEAST TWO POTATOES SHOULD BE COOKED IN THE REGULAR SIZE BAG. THE MINI BAG IS PERFECT FOR COOKING 1 OR 2 POTATOES AT A TIME. Our bag is hand made in a smoke free environment here in the USA! Click here to see a video demonstrating how the bag works! 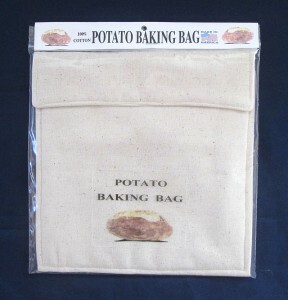 Order your Potato Baking Bag today! The Original Size Bag is $10 + S&H. The Mini Bag is just $9 + S&H. To pay with PayPal, or with a credit card through PayPal, click on the “ADD TO CART” button below. To pay with credit or debit card Direct, By Phone, call us with your order at 386-774-4415. Want to order more than one bag? After you press “Add to cart” you will have the option to change the quantity. Ordering 10 or more bags? See our wholesale page for special offers! Copyright 2015 Malone. All rights reserved.